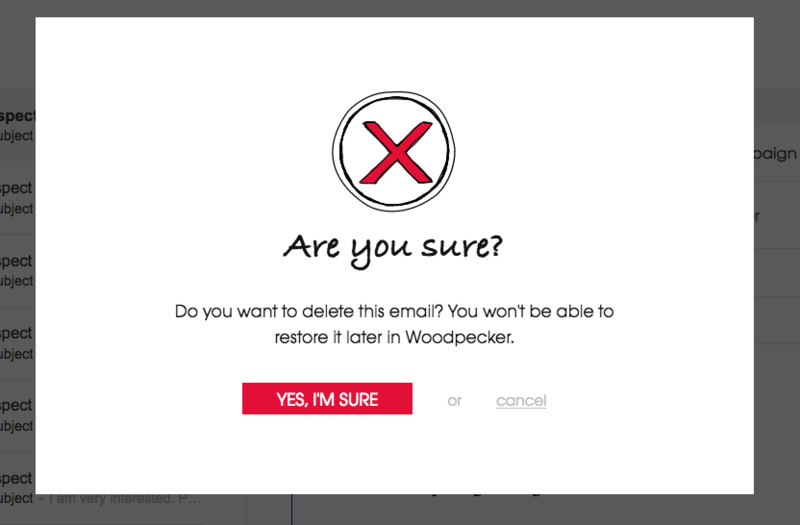 There a few ways you can handle deleting emails from your Inbox in Woodpecker app. Delete this email - only deletes this specific message. Delete all past & future emails from this prospect - deletes all emails from this prospect and prevents from any future emails you might get from them from appearing in Woodpecker Inbox (They will still come to the inbox on your email server). Delete all past & future emails from this domain - deletes all emails from any prospects sharing this domain and prevents from any future emails you might get from them from appearing in Woodpecker Inbox (They will still come to the inbox on your email server). As can be see on the above screen deleting correspondence from Woodpecker Inbox is permanent.